We all want to meet people from history! The trouble is everyone is dead! So it’s time to prepare yourselves for Horrible Histories live on stage with the smash hit production of Barmy Britain – Part Four! Would you be shaken or stirred by Richard III? Mount a mutiny against King Henry VIII! See Mary Tudor knock the spots off Mary Queen of Scots! Will Queen Elizabeth I endure her terrible teeth? Would you be hanged by King James I for being a witch? Peep into the world of Samuel Pepys and help Georgian detectives find the headless man! Take a trip into the night with the night soil men and discover how to survive the first ever train ride! After seven sensational years in the West End, Barmy Britain is back! 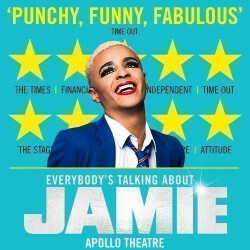 Everybody's Talking About Jamie is a brand new but already hugely popular 2017 musical with music by Dan Gillespie Sells and a book and lyrics by Tom MacRae. It was inspired by the remarkable BBC3 documentary, screened in 2011, called Jamie: Drag Queen at 16, and it's on at the glittering Apollo theatre. The Apollo Theatre is a magnificent building with an impressive French Renaissance façade, typical of theatre designs of its time, with four angels looking down from above. And the interior is equally stunning, in deep gold and bright silver, cool cream and rich terra cotta red, with beautiful carving and scarlet plush seating arranged traditionally in three sumptuous tiers. Look out for the fabulous mural and amazing carved ceiling. And, to the right of the entrance, the dramatic flying lizard emblem complete with lions and silver chains. 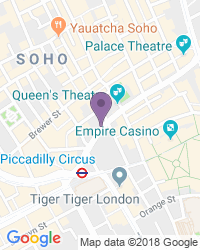 Named for the Greek god of the Arts and a Grade Two listed building, the Apollo Theatre was designed by Lewen Sharp and is one of smallest of Shaftesbury Avenue’s six theatres. When it was first designed, two exciting innovations were included: a pillar-free auditorium, so there’s no such thing as a restricted view. And a specially-created orchestra pit designed specifically with acoustics in mind for a crystal clear sound. Opened in 1901, in the same year as Queen Victoria’s death, it was effectively the first purpose-built Edwardian theatre. Originally built to house musical comedies, the Apollo put on a run of plays during the First World War. In between the end of the first and the beginning of the Second World War it came into its own with popular comedies and revues and finally, in 1944,became home of the infamous Noel Coward play, Private Lives. For the next 40 years, long-running light comedies were the Apollo’s stock in trade. It was given a facelift in 1965 and between the’70s and ‘90s remained a showcase for fantastic writing and acting talent. Since 2005 the Apollo has been owned by the Nimax Theatres chain and continues its long history as a well-loved West End show venue. Kicking off with a series of light operas including 1901s Kitty Grey and 1904s Véronique, the Apollo Theatre has been home to the best of British and international writing. It showed Ivor Novello’s A Symphony in Two Flats in 1929 and the Pulitzer Prize winning Idiot’s Delight, by Robert Sherwood, in 1938. Terrence Rattigan’s Flare Path graced the stage in 1942, to rave reviews, and Noel Coward’s Private Lives hit the big time there in 1944. More recently the Apollo has staged Driving Miss Daisy, Jeffrey Bernard is Unwell, The Deep Blue Sea, Pop Corn and more, with stellar performances from an impressive collection of household name actors including Vanessa Redgrave, Zoe Wanamaker, Peter O’Toole and Penelope Keith. The entrance is through a door to the left of the Upper Circle entrance, on Shaftesbury Avenue, beyond which is a stair lift to the stalls, and stairs with handrails. We’re a trusted destination for a wide variety of seat types and prices, with excellent availability on the full range of Apollo Theatre tickets.